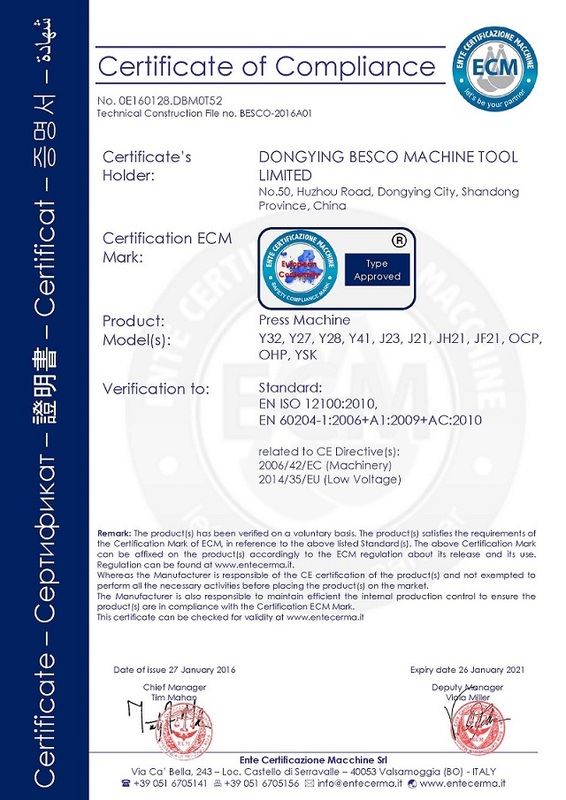 Besco Machine Tool Limited established at 1997, located at Dongying City, Shandong Province China, is a professional machine manufacturer, and our main product includes press brake, shearing machine, bending machine, power press, hydraulic press, duct manufacture machine and so on.Our company annual manufacture value is above 80000000 RMB, in which more than 25000000 Yuan are for exporting. Our company has perfect after sales service system, and there are total 14 sales and after sale service agencies in different big cities, 26 technicians special for after sale service and machine maintenance. At oversea market, our company is going to establish departments at European and Middle Asia to enlarge our service area.All the times we put the machine quality at the first position, focusing on the machine development and update, which keep our company with a fast development speed and getting good reputation from customers. Our long-term cooperation company include: Foxconn, NK car, China Aluminum Group, Sany Group, Fangyuan Group, Tianrun Crankshaft, Konka, etc. Our company makes satisfying the customers as our target, and we hope to create the best future with old and new customers.